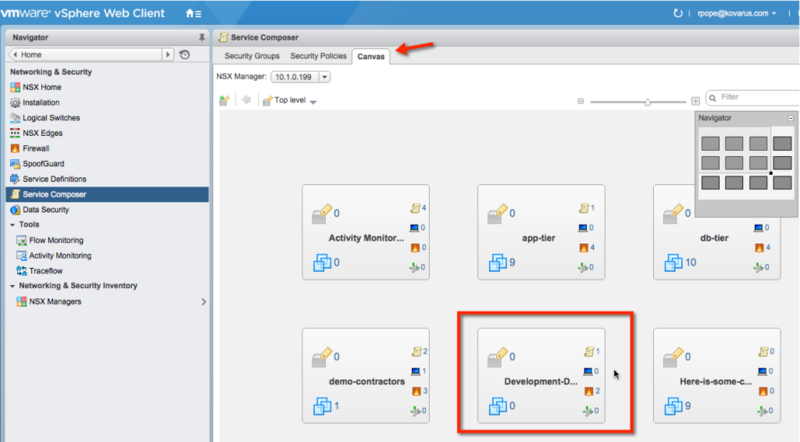 After a bit of white boarding, I decided we should check out VMware NSX’s ‘Service Composer’ feature. I pulled it up in our lab (the Kovarus Proven Solutions Center) so we could see it in action. I figured it would be easier to understand once everyone could see how it gets set up. 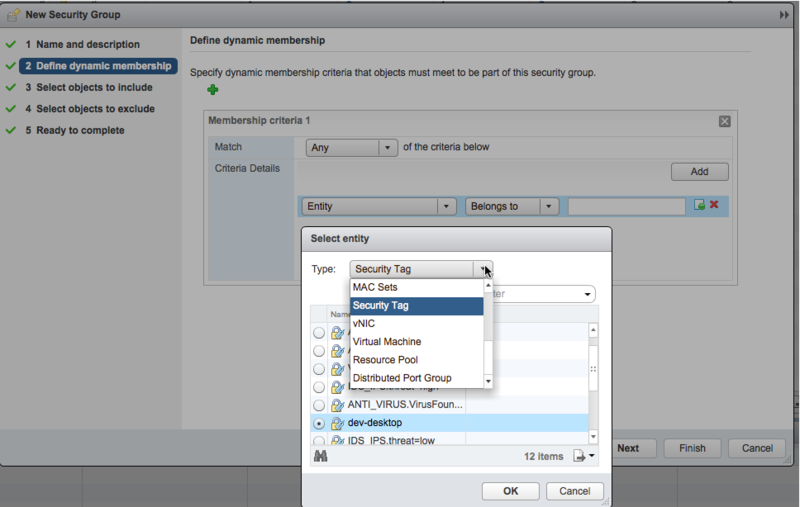 We created a series of dynamic groups (called ‘Security Groups’ in NSX parlance) and attached some basic policies to them. One of the more useful features in the service composer is the ability to dynamically determine membership based on a wide variety of potential criteria. 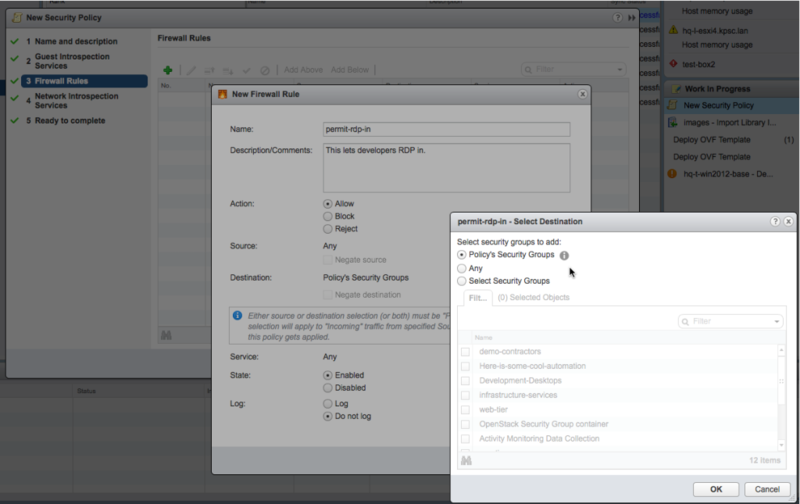 So what does putting together a NSX distributed firewall look like? 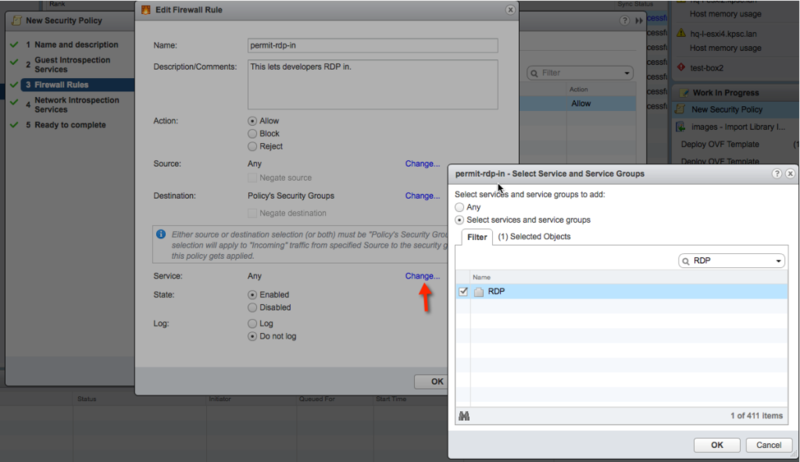 When you click on Service Composer, it will take you to the Security Groups view. 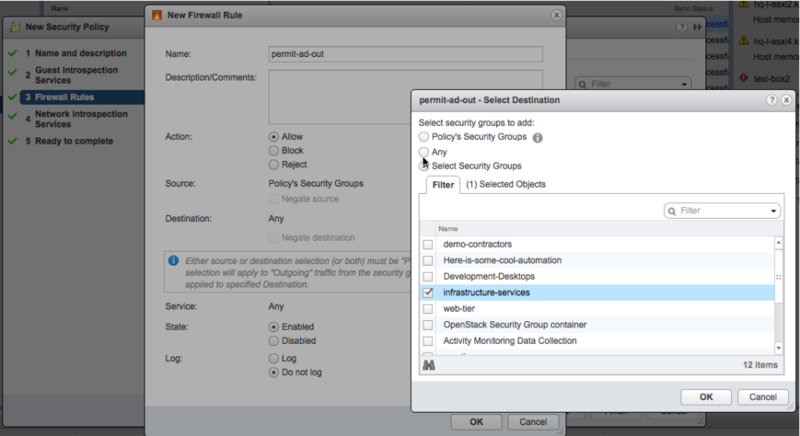 Here we can create new Security Groups or view information about existing ones. We’ll go ahead and create a new Security Group by clicking the ‘New Security Group’ button. This will launch a wizard where we can define the criteria for dynamic membership. Now we can define our membership. We’ll look more closely at entity since this one has a LOT of options. 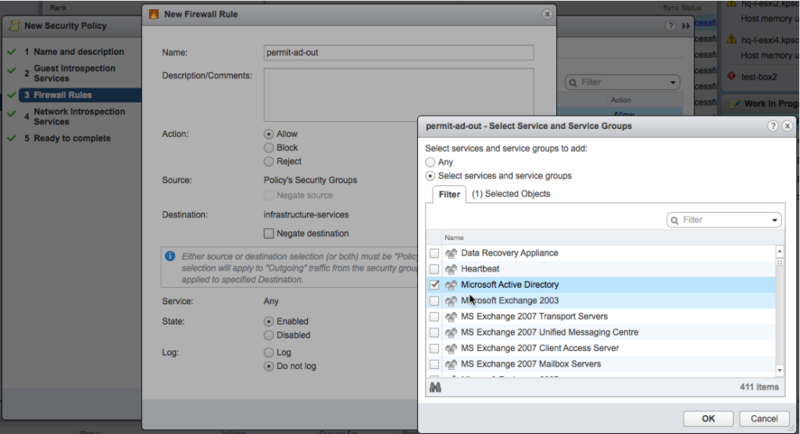 For example, we can select a specific cluster, portgroup, Data Center, resource pool or a number of other criteria. I did it this way so I could be specific. You could actually just select ‘Security Tag’ and ‘contains’ to get the same result but then you’d have to remember what the tag actually was. When we hit ‘next’, it’s now going to ask what objects to include. This allows us to ensure that systems that don’t meet the previous criteria get added if we need them. For example, we might want to add specific VMs or other security groups to this one that we’re unable to tag for whatever reason. We’ll go ahead and hit ‘next’. It will now ask what objects we want to exclude. This is where we can remove specific virtual machines, clusters, etc. from the security group. We’ll go ahead and finish the wizard. Now let’s go build some policies! When you click the ‘new policy’ button, another wizard launches. It’s going to want you to name and describe the policy (you can have it inherit another policy). There’s an advanced option for ‘weight’ which allows you to determine which policy takes priority in the event there is overlap. Highest weight will win in this case. We’ll skip over guest introspection services for now and go right to firewall rules. Here, we’ll just create a few basic test rules. We’ll allow RDP in and active directory out. For RDP in, we’re going to give it a name, set the action to allow and change the source to ‘Any.’ The destination we’re going to set to ‘Policy’s Security Groups.’ What this will do is say “anything this policy happens to be applied to, let’s allow it RDP in! We do this so we can re-use some of our more common rules. At this point, we’ll go ahead and add the rule to let it talk out to AD. It’s a lot of the same steps; except for the ‘Destination,’ which we’re actually going to change to ‘Select Security Groups’ then pick our ‘infrastructure-services’ security group. I made this group earlier and it contains my AD servers for the lab. 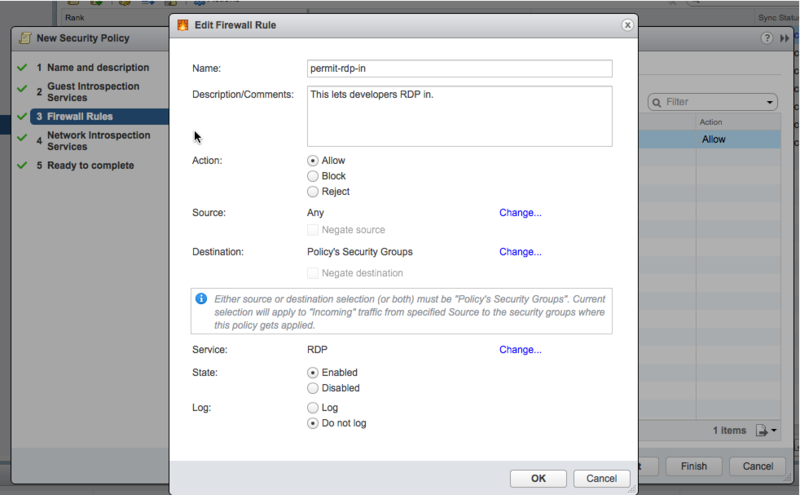 Now, I have a second firewall rule ready. I could create more for different applications or I could re-use existing ones. 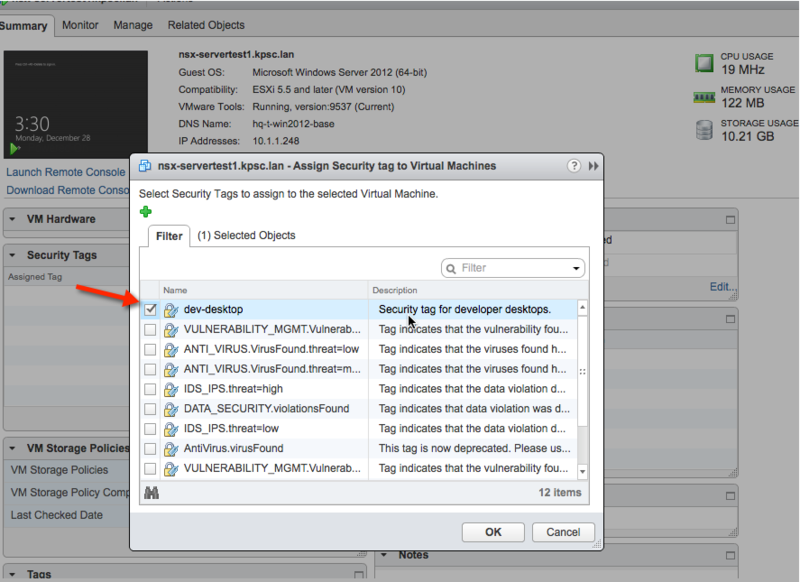 You can apply more than one tag to virtual machines as well. We’re keeping it simple. 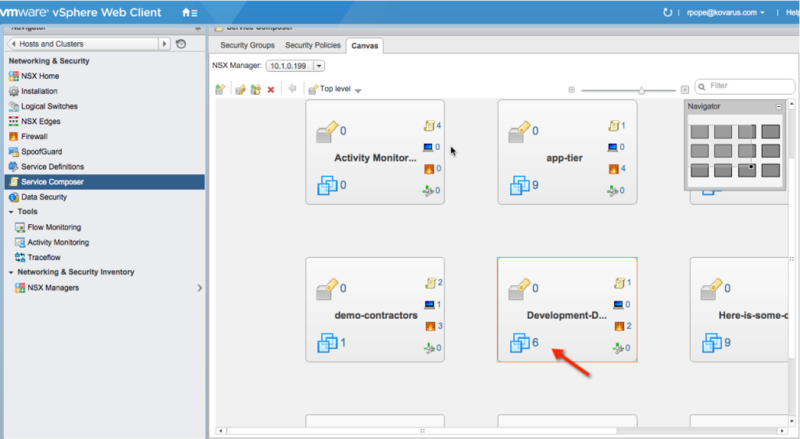 You can also apply security tags from NSX manager, which may be handy if you want to do it in bulk and don’t feel like writing a script to do it. 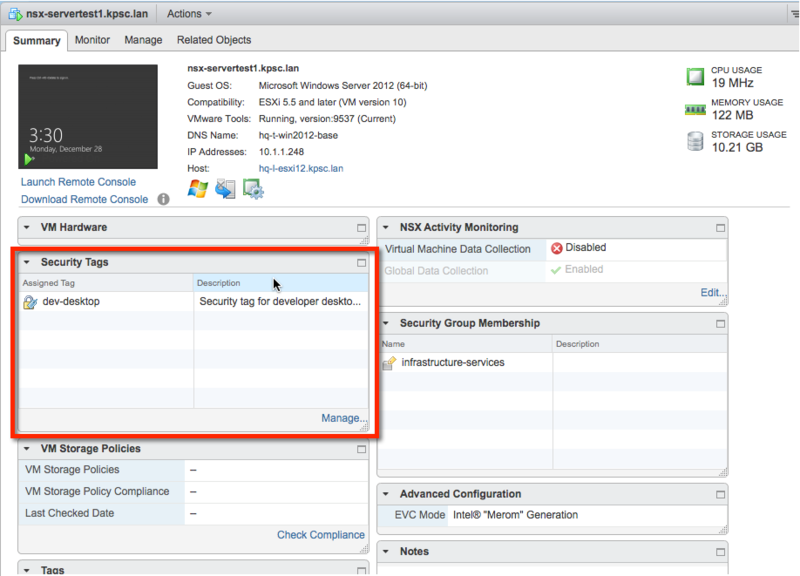 Go back to Network and Security→ NSX Managers and select your NSX manager instance. 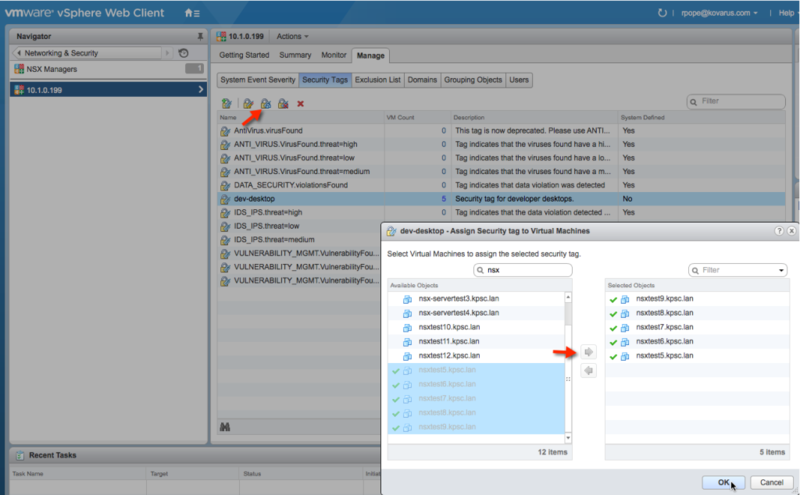 Click the security tag you want to add VMs to and hit the ‘Assign Security Tag’ button. 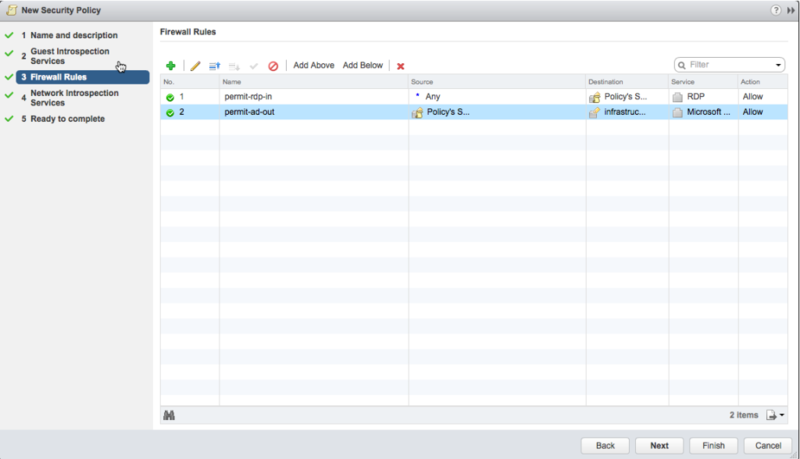 So, instead of seeing 12 rules (because we have six VMs), we just see the two rules. If I build more developer desktops, I just need to apply that security tag to them and they’ll end up with the exact same rules applied. If I’m using an automation tool like vRealize Automation, then I can just add the tag as a part of my provisioning workflow. It’s a little bit of upfront work but it’s going to pay off in the long term. If you’d like to do a workshop with us to go into more detail, please feel free to reach out to us to schedule a Kovarus Proven Solutions Center workshop!